Claims can be reported 24 hours a day, 7 days a week. Pick and Choose the coverage that best work for you. Pays for damage to persons or property caused by an insured person while operating the insured vehicle. 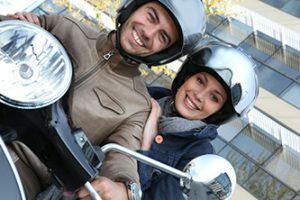 Provides Protection for legal liability when a guest passenger is injured on the insured motorcycle. Protects you and your passenger for damages caused by other drivers who are at fault and have no insurance or not enough insurance to pay your damages. In some states, coverage for damage to property is also available. Provides a dollar amount for medical bills resulting from a motorcycle or ATV accident. In some states, this applies only after other medical insurance is exhausted. Pays for damages to your motorcycle or ATV caused by losses other then collision. Ex: fire, theft, vandalism, etc.. Pays for damage to your motorcycle/ATV if caused be accident regardless of fault. Provides up to $1,000 of coverage when you purchase collision coverage. This coverage provides protection for custom parts and equipment added to your bike/ATV after is leaves the factory. Additional accessories can be purchased, up to 50% of the motorcycles’ manufactured suggested retail price with a maximum of $5,000.